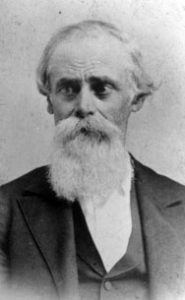 By 1858, the land had been sold to John B. Chastain. On March 24, 1858, he sold the land itself to Thomas Wilson, but he reserved all of the mineral interest. 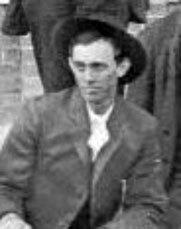 On May 24 of the same years, John B. Chastain sold half of his mineral interest to Simpson Reid and William Martin for $500.00. 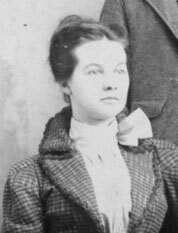 The next surviving deed related to Land Lot 71 was made on February 21, 1869, when Teresa C. Mauldin, Cordeila L. Mauldin, and Mary A. Crane sold nine acres “below the cliff” to James Walker for $22.00. They sold the remainder of the Land Lot, along with other land, to Jacob N. Gibson on May 30, 1878, for $1500.00. Our last letter left us at the foot of Bell Rock Mountain, in Towns County. All day we had been told of this wonderful knob, until our curiosity was so wrought upon that we decided to visit it, although a former tour up Mount Yonah had wrung from our perspiring breast a vow to never attempt another ascent until our soul should soar to those blissful realms above. The house at which we had stopped was said to be only two miles from the summit of “Old Bell,” but before we had been beguiled by those mountain miles and fully realized the fact that those two miles would require the greater part of the day to traverse. The average mountaineer has a very singular idea of distance. In fact, we believe that each one has a measurement of his own, which none of his neighbors deem it just to infringe upon. So a point that one fellow’s calculations estimates “three-quarters at a mile,” the next native will call five, seven or ten miles. To illustrate the truth of this we will recount our experience in reaching the top of Bell Knob. We had probably left the two-mile man nearly a league behind, when we halted at a store and asked the proprietor the distance to the Bell. He remarked that if it wasn’t for the clouds we might see its top. The distance couldn’t be more than tree and a half or four miles. We started again on our journey and taking the condition of the road in question could not have gone less than eight miles, when we drew up at the house of an old lady and shot off our Bell Mountain conundrum. To our amazement she remarked that she had “never hear’n of sich a place.” We explained that Bell Mountain was a noted resort and could not be very far distant, intimating that a large mountain to the right of her house might be the Mecca in question. “Well, mebbe it is stranger,” was her reply; “but we always called it the knob. If there is any Bell about here I’ve never hearn of it!” We were truly in a bad box. It had begun to drizzle rain: we were far off from the main road, traveling a neighborhood path right in the heart of the Blue Ridge. We didn’t want to turn back now, but what to do was the question. At last a bright idea seemed to strike the old lady, who evidently pitied us. “Be younses from the lower regions?” she asked. We blushingly acknowledged that we were. “You are strangers, then, in these parts?” “Yes!” “People don’t come up here often onless they be revenue officers!” she suggested. We wasted fifteen valuable minutes expressing our denunciation of revenue officials. “Well,” remarked the old lady, “I ‘spect if there be any Bell Mountain around here that Mr. McClure, who lives about a mile down the road, can point it out to you.” We thanked her and moved on. At least we came to a place where even our blind path gave out; but fortunately a little house was discovered hidden under the mountain bluff, and from the occupants we received directions to Mr. McClure’s. We found that gentleman at work clearing a field, and he very readily consented to guide us to the top of Bell Mountain, which he said was two miles and a half to the summit. This we found to be strictly true. Mr. McClure is an intelligent and kind gentleman, and we are under obligations to him for many favors. We had a toilsome climb up old Bell. A long and precipitous spur juts to one side, and up this we clambered, holding on to bushes and stones. One elevation after another was scaled, and still the peak towered far above us. When on the last plateau we came to a veritable Eden above the clouds. The mist hung below and about us, but above the sun shone brightly. In this little plateau, at the base of the rocky knob, we found a cool spring gushing from the mountain top, surrounded by a garden of ferns. The soil must be very fertile, for we never saw such timber. There was some singular fungus growths here, too. Among them we noticed a frog-stool as large as a wash-tub, while the rocks on the summit were covered with a substance closely resembling a wool hat, mounted on a smooth surface that stretched like India rubber. In a little vale is a large Indian grave, formed of a circular heap of rocks, that overlooks the valley below. A more romantic or retired spot for a sepulcher could not have been found. After quenching our thirst and resting awhile we began the last ascent. Up, up, up we went, piercing the clouds until our further progress was barred by a ledge of huge and irregular boulders that formed the backbone of Bell Mountain. With great difficulty we climbed to the topmost pinnacle, and reached a large rock that towered above all others. It was a hazardous climb, for a slip of the foot would carry one over a sheer precipice fully half a mile high. But we were richly repaid, in the magnificent view spread out before us, for all our fatigue. As we reached the summit the clouds were lifted as if by the hand of enchantment, and the grandest sight that mortal eye ever rested upon met our gaze. As far as the vision could reach the country was laid bare before our sight. Not a shrub obstructed the view. Far below was spread out, like a living panorama, the valleys, the farms, the mills, the houses, the fields, the forest. With one sweep of the eye every foot of Towns County could be taken in, a greater part of Rabun, while the village of Hayesville, N. C., eight miles distant, seemed to nestle with its white houses at your feet. One could almost imagine that he could hurl a rock upon the roof of the courthouse at Hiwassee. It is impossible for the pen to do justice to this scene, for several famous tourists who have visited this mountain pronounce it the grandest view in America. The country looks like a huge flower garden, laid out by the hand of an artist, while vast tracks of forest seem but beds of shrubbery. The distant knobs rise like mounds upon the scene. At your feet are spread the beautiful and fertile Hiwassee and Bell Creek valleys, with their numberless branches, each rivaling in size and fertility the famous Nacoochee. You can trace the various mountain passes, that seem to have been hewn by the hand of some giant that a highway for traffic with this beautiful land might be made. While on one side the eye grasps vales and farms and trees and peaceful homes, but glance to the other hand and you see a boundless expanse of mountain ranges, towering one above the other. Every important peak in Georgia, North Carolina, and even Tennessee can be seen. Old Eagle, like some couchant animal, lays at your feet, while the sharp peak of Enota, the highest point of land in Georgia, towers in the northwest, some seven or eight miles distant. But the formation and shape of Bell Mountain is no less a wonder than the view from its summit. When railway communication is opened to Hiwassee it will become one of the greatest curiosities on our continent. While on one side ascent is comparatively easy, on the other there is a sheer descent, said to be over half a mile. This precipice is of beautiful quartz rock, reflecting in the sun all the rays of the rainbow. From the valley below the mountain appears to lean over, threatening to topple from its foundation. Houses are built immediately beneath its eaves, and can be plainly seen by persons on the summit. But in exploring this pinnacle you must be very cautious, for as we before said, you are on a very sharp and narrow ridge and a false step would seal your doom. There is a path underneath the cliff that leads into a cave in the rock called the “Devil’s Workshop,” but it is a very dangerous place to reach, as you must clamber on a narrow shelf upon hands and knees, with not a bush to cling to. In places this shelf is but a few inches wide, and inclines over the precipice alluded to above. We went part of the way and turned back, as the view will not repay one for the danger. There are other curiosities on the summit, however, equally as great. We say one place where a large quartz boulder had lodged across a passage between the rocks, forming a large room, protected on every side from rain and wind. There are several “fat-man’s squeezes,” of all sizes and shapes. But the most wonderful curiosity is a large pillar of white quartz, that stands upon the brink of a precipice, its spire towering upward. No sculptor could have hewn a more symmetrical shaft. This pillar rests upon two small pedestals and it seems that the slightest pressure would send it crashing into the valley below. But its foundation is firm, for twenty men, we are told have worked at it with prizes without throwing the stone from its balance. The people call it “Chimney Rock,” but we rechristened it “Jenkin’s Monument,” in honor to one of Georgia’s noblest sons. We tried to chisel his name upon the stone, but the surface was too hard. Bell Mountain is a solid mass of the most beautiful crystal rock of all shades and colors. It is often taken for marble. We brought away specimens showing the various shades. We lingered for hours upon this wonderful peak of the Blue Ridge, drinking in the view and were loath to leave it. But our appetite, sharpened by the bracing air, announced that the hour of noon had long since passed, and with reluctance we made the decent. After a nice dinner at Mr. McClure’s we that night drove into Hiwassee, of which we will speak in our next. 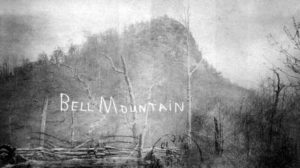 We will conclude this letter however, by advising all of our readers to visit Bell Rock Mountain, if they want to see what we consider the greatest curiosity in Georgia or the south. It is only 35 miles distant from Clarkesville, the road leading through a wild and romantic country. T. Larry Gantt, “Through the Mountains.” The (Athens, Georgia) Banner-Watchman, August 14, 1883. On May 3, 1952, both Jesse H. Gibson and his wife Esta Russell Gibson made their wills in which they desired that all of the property of the survivor be left to the “Georgia Baptist Foundation, Inc., a corporation of Fulton County, Georgia, as Trustee, for the following purposes: The said trustees shall invest and reinvest said property and shall use the net income therefrom as a student loan fund. It is my preference that these loans be made to those who shall be students at Truett-McConnell Junior College located at Cleveland, Georgia…as a memorial to J. H. and Esta Gibson.” Esta Russell Gibson died November 3, 1957. Jesse H. Gibson died January 16, 1960. In accordance with their wills, Bell Mountain passed to the George Baptist Foundation, Inc., on December 19, 1961. About 1960, Grover C. Mauney, Walter Mauney, and Dr. William A. Hoover, all of Murphy, North Carolina, organized the Hiawassee Stone Company, Inc., for the purpose of mining quartzite. Under Grover C. Mauney’s direction, the top of Bell Mountain was blasted and the quartzite “was hauled down the mountain to a crusher/washer/grader and then shipped to the nearest railhead at Murphy.” The white quartzite was not as deep as had been suspected and other colors began to appear. This, coupled with the increasing cost of extraction and transportation, caused the venture to fail. The cost of producing one ton of product was $35.00. The going rate for one ton was only $30.00. On May 16, 1963, the Hiawassee Stone Corporation was dissolved. 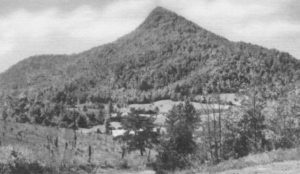 Studies were made in 1964 and 1973 by the state of Georgia on the viability of working the vein of quartzite on Bell Mountain, but the costs were prohibitive. On October 1, 1971, the Georgia Baptist Foundation, Inc., sold Land Lot 71 to Hal Herrin and E. N. Dowdy for $60,000.00. James Smith, The Cherokee Land Lottery, Containing a Numerical List of the Name of the Fortunate Drawers in Said Lottery, with an Engraved Map of Each District. New York: Harper & Brothers, 1838. 1849 Tax List – Union County, Georgia. George White, Statistics of the State of Georgia. Savannah: Williams, 1849. Towns County Deed Book A, page 391. Towns County Deed Book A, page 259. Towns County Deed Book B, page 358. Towns County Deed Book C, page 571. Towns County Deed Book M, page 297. T. Larry Gantt, “Around Athens.” The (Athens, Georgia) Banner-Herald, February 21, 1926. Wills of Jesse H. Gibson and Esta Russell Gibson, May 3, 1952. Towns County Deed Book H-1, page 138. Dale Hughes, “Qaurtzite Mining Atop Hiawassee’s Bell Mountatin.” 2001.